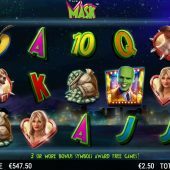 The Mask slot has been developed by NextGen Gaming and joins a raft of other slots that are tied in with great 90’s movies such as Jurassic Park, Gladiator and Austin Powers. The theme for The Mask movie is about an everyday guy called Stanley Ipkiss (played by Carrey) whose life is changed when he finds a magical mask, granting him special powers and a brand new personality. This slot game features characters and items from the movie in a cartoon style, as well as clips that will be instantly recognisable to Mask fans. As for the sounds, they can be a bit overbearing at times and you may find yourself turning the volume right down or even off. So will The Mask bring us our own special powers (of amassing wealth) or will we be left less than impressed by this comic disguise? This is a 5 reel slot with 3 rows and 20 paylines in total. Characters from the Warner Bros-produced movie can be found on the reels including Stanley Ipkiss (played by Jim Carrey), Tina Carlyle (played by Cameron Diaz) and Stanley’s dog Milo. For 5-of-a-kind (5OAK) you will get 100, 75 or 50 coins respectively. These are then followed by The Mask Hat and Bags of Money. The lower paying symbols, as is typical, are the A-K-Q-J-10 card symbols. The Mask Wild is an important symbol, as it is a key element of the base game features, as well as the bonus game. For a 5OAK you will get 150 coins and interestingly there are pays for 2 Wilds on a winline - which is the first indicator of a low volatility slot. The bonus scatter is also a key symbol because 3 will trigger the bonus, but you will also earn 500 coins for 5OAK. Alarm Block feature – An alarm clock will start bouncing around the reels. Should the hammer smash the alarm clock then a 2×2 block of Wilds will be added to the reels. In a Spin feature – The Mask appears and will spin like a tornado around the reels. The tornado can turn any of the symbols (except the scatters) into Wilds on up to 3 reels. By the Horn feature – The Mask will appear and squeeze a cartoon horn. The blast from the horn will turn some symbols into Wilds on up to 4 reels. Mask Unmask feature – The dog Milo appears on the reels and places the Mask over a random 3×3 reel positions. All Stanley symbols that are covered by the Mask will become Wild. The last two of the these base game features will occur after a spin has finished rather than during the spin. As you might expect The Mask slot has a free spins bonus feature. You need to land 3, 4 or 5 bonus scatters anywhere on the reels and you will be rewarded with 10, 15 or 25 free spins respectively, along with a fixed win based on the number of scatters. In the free spins The Mask Wild symbol will multiply wins by 2x, 3x, 4x or 5x. If the 1 or 2 scatters appear then it will activate a masked Milo and award up to 5 extra free spins. If 3 or more scatters appear in a single spin then you will granted a load more free spins. The base game features are also present and you will find that they tend to trigger more regularly.